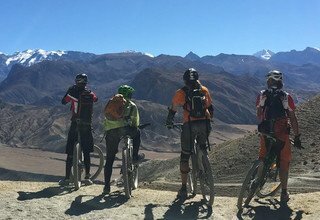 Mountain Biking Trip to Upper Mustang is a fulfilling off-road journey for adventure lovers who seek thrill in the remote Himalayas. 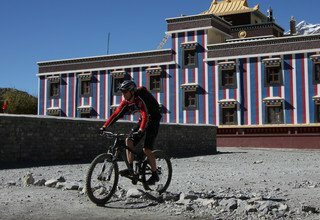 The exhilarating feeling of biking in the restricted areas of Upper Mustang and to the desert capital of Lo-Manthang, whilst enjoying the vista of snowy mountains and barren hills, cannot be experienced anywhere else in the world. The challenge to ride is nothing when compared to the incredible scenery and cultural lifestyle of the locals that the trip has to offer. Mountain Biking Trip to Upper Mustang begins at Kathmandu. The journey is led by a flight from Kathmandu to Pokhara, and then a picturesque short flight from Pokhara to Jomsom—the beginning point of the biking trip. From Jomsom, you begin your bike trip by riding along the Kali Gandaki Valley on a flat and rocky jeep track towards Kagbeni. From Kagbeni, you continue to ride uphill towards Muktinath, the holy temple of Lord Shiva. Then the ride follows the trail towards the forbidden land of Upper Mustang. Passing through the villages of Chele, Syangboche, and Tsarang, you reach Lo-Manthang. Lo-Manthang is the walled capital of the former "Kingdom of Lo" and is home to numerous antique monasteries and well preserved Tibetan culture and tradition. From Lo-Manthang, we return back through some new single-track routes, with superb views of surrounding high peaks and breathtaking valleys. We pass through the apple orchards of Marpha and continue to descend to reach Tatopani to wash away your tiredness after the thrilling biking adventure. From Tatopani, you will ride to reach Beni. The audacious and exciting mountain biking experience to Upper Mustang ends, with a drive from Beni to Pokhara and followed by a flight back to Kathmandu. Swiss Family Treks and Expedition is one of the thriving travel agency in Nepal and offers some of the most exciting trips around the country. 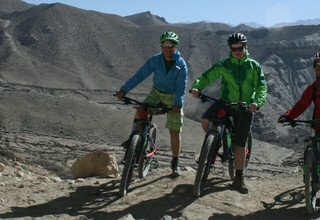 For the biking trip to Upper Mustang, we provide you with an experienced bike riding guide who can assist you even with technical difficulties. We make sure the bikes are in their best condition before assigning you with one. To make your overnight stays comfortable, we make sure you are accommodated in the best hotels and lodges. Kindly, note that you should check-in for all the domestic flights at least one hour prior to the flight schedule, and also understand that the flights are subject to delay due to bad weather. Welcome to the amazing city, Kathmandu. We will greet you in the arrival section of Tribhuvan International Airport and will take you to your hotel. Enjoy the evening exploring the vibrant streets of Thamel or just resting in your hotel room. Overnight at a 3-star hotel in Kathmandu. Today, we will spend the first half of the day to acquire your permits as you will be traveling to some of the restricted areas of the Himalayas. We will take the afternoon flight to Pokhara. We fly over the villages, the lush hills, and the mountains that make up for a breath-taking view. On arrival in Pokhara, we will transfer you to the hotel. Enjoy the evening strolling and doing recreational activities in the Lakeside area. Overnight at a 3-star hotel in Pokhara. Early morning, we drive to the airport and take the first flight to Jomsom (20minutes). Flying through the deepest gorge in the world, Kali Gandaki, the Pokhara-Jomsom flight marks the start of your adventure. On arrival, we will have our breakfast and assemble our mountain bikes. Then, we start biking to Kagbeni. Riding in the Kali Gandaki Gorge, we follow the jeep trail to reach Kagbeni. En route, we can visit red painted Gumba which is about 1000 years old and explore other areas as well. Stay overnight in the lodge. We start early so that we can enjoy the breathtaking views of the sunrise that lights up the white snowy peak in gold colors. After enjoying and taking some good pictures, we start biking uphill to Muktinath on jeep track. We will have lunch in Jharkot where we can explore different monasteries and local people along with their culture. We continue ascending uphill till we reach the holy temple of Muktinath. Stay overnight in the lodge. Today, we visit the temple of Muktinath for the morning puja. We then continue riding to the mysterious land of Upper Mustang. 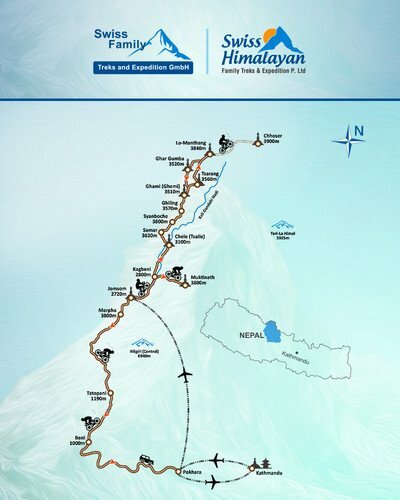 We will ascend uphill to Gyu La Pass (4077m) and then descend to Chhusang. We then ride through the bumpy roads near the banks of Kali Gandaki River and cross a bridge. We ride uphill to reach Chele which is a small village that rewards you with the spectacular view of Mt. Nilgiri (7061m) and Kaligandaki gorge from a different angle. Here, we explore some old buildings and monasteries. Stay overnight in a lodge. We move towards the north towards the magnificent Himalayas. We will have an amazing view of the places and the landscape as we move uphill. There are altogether four passes in between Chele and Syangboche—Taklam La (3624m), Dajori La (3735m), Bhena La (3860m), and Yamdo La (3860m). We will have a brief stop in Samar and again continue to ride towards Syangboche. We shall meet local people and get to know about their lifestyle and culture. Watch out for ponies and donkeys along the way. Stay overnight in Lodge. To start, we make a short climb to reach Syangboche La Pass (3850m). From Syangboche La, we can get an amazing view of Nilgiri (7061m) and the Annapurna massif. We will then ride on the plain trail then descend to Gilling then ascend through some gorgeous villages. Crossing Nya La Pass (4025m), we descend to Ghami via Ghami La Pass (3765m) to enjoy the Tibetan food. Then crossing Mani walls, an old monastery, and then the village of Drakmar, we arrive in Tsarang. Stay overnight in Lodge. Today, we will finally reach our destination of Lo-Manthang, the mysterious enclosed city of rich Buddhist heritage and also the walled capital of the former 'Kingdom of Lo'. It is a relatively easy day ride where we have to cross Lo La Pass (3950m). Here, we can experience amazing and breathtaking 360-degree view of the mountains. We will be riding on open jeep ways and some trekking lines. After the pass, we will finally reach Lo-Manthang after about half an hour. Stay overnight in Lodge. Today, we get the opportunity to explore the captivating Lo-Manthang with its centuries-old Gumba, the Royal Fortress, inhabited caves, museum, and antique Buddhist ways of life. The colorful deserts make up for amazing pictures, and with the mountains on the backdrop, it is a view to die for. We can even find the heirs of the former King and Queen of Lo and learn about the folklore of the region. Stay overnight in Lodge. We bid farewell to this amazing place and head back on some new single-track routes. We will have to cross three passes—Lo La (3950m), Chogo La (4280m), and Mui La (4170m). En route to Ghami, we will arrive in Ghar Gompa, an ancient monastery and the most sacred one for Lo Nying Sect of Buddhism. We can find scriptures of Padmasambhava in Ghar Gompa. Then we ride down to Dhakmar and finally to Ghami. Stay overnight in Lodge. We will now retrace the route from Ghami to Samar. We cross five passes and several small streams on our way to Samar. We ride past many small villages, monasteries, and barley fields, to arrive in Syangboche. We also reach Chungsi Cave as we ride alongside Syangboche Khola. We then cross Jhuwa Khola and Samarkyuno Khola to finally reach Samar. Stay overnight in Lodge. We will start early in the morning with small ascend to Dajori La Pass (3735m) and then ride downhill to Chele. We will ride along the banks of Kali Gandaki River to Kagbeni and have lunch in either Chhusang or Kagbeni. After lunch, we ride back along the Kali Gandaki Valley to our initial point in Jomsom. Then we’ll ride through beautiful apple orchards to the lovely village of Marpha. We will stay overnight in Marpha which is famous for its Apple brandy or other by-products. Stay overnight in Lodge. We start early and explore some of Marpha—the monasteries, the cheese factory, and the traditional whitewashed houses. After a good breakfast, we will ride toward a more subtropical region along the Kali Gandaki River. We descend all the way with amazing green landscape and the peaks of snow-capped mountains that accompany us throughout the trek. We reach Tatopani where you can relax in the natural hot spring to relax your body strains and skin ailments. Stay overnight in Lodge. After breakfast, we ride along the river banks on a jeep track to Beni Bazaar where we will meet our ride to Pokhara. It's now time to say goodbye to your riding partner—the bike. Our vehicle will be waiting to drive us back to Pokhara and transfer us to the hotel. Stroll and shop around the amazing lakeside and also enjoy the nightlife here. Overnight at a 3-star hotel in Pokhara. Day 15: Fly from Pokhara to Kathmandu for 25 minutes. After breakfast, we drive to Pokhara airport where we take the flight back to Kathmandu with picturesque views of Annapurna massif, Lamjung Himal, Manaslu range, Ganesh Himal range, and Langtang Himal for 25 minutes flight time. Upon arrival in Kathmandu, we transfer you to the hotel. Feel free to explore the local markets of Kathmandu. Overnight at a 3-star hotel. Today is the farewell day. Our company representative will drop you at the airport 3 hours before the flight time. We hope to see you again. * 4 nights accommodation in twin bed sharing basis with breakfast at 3*** hotel in Kathmandu and standard hotel in Pokhara. * Domestic flight tickets from Kathmandu-Pokhara-Jomsom and Pokhara-Kathmandu and airport tax.